A Modern & Minimal Design Classic: The Stendig Calendar- get yours NOW! Calling all lovers of midcentury modern design: pull up your Eames rocker, turn on your Arco floor lamp, and keep track of what day it is with your very own 2012 Stendig Calendar. Designed in 1966 by Massimo Vignelli, this minimalist classic is the only calendar in the permanent collection of the Museum of Modern Art (impressive!). Black and white with a streamlined and simple design, it’s sure to make a statement in any home or office. 2012 Stendig Calendar – $36. And people– if you want one of these, get them NOW! I can’t tell you how many emails we got for these all year (up until first weeks of November!) for the 2011 calendar….crazy Stendig-ers! The mustache craze continues and we are absolutely thrilled to get this new must-have kitchen tool in: say hello to the Munchstache Cookie Cutter! If you’re having a Groucho Marx themed party, or getting nostalgic over an old episode of Magnum PI, or hanging out in Williamsburg with some mustachioed friends, this cookie cutter is perfect for you (or a great gift for anyone who appreciates the glamour of a ‘stache). And don’t worry, we have lots of other exciting mustache products – like this and this – plus more special treats in store only! Come visit and check them all out! Munchstache Cookie Cutter – $12. We are psyched to be featured on Brokelyn for our participation in Small Business Saturday! Tomorrow, Saturday, November 26th we’ll be giving away Naughty and Nice pins with purchases (while supplies last). Also be sure to register your AmEx card to receive a $25 statement credit when you shop at a small business like ABRGS tomorrow. SUPPORT SMALL BUSINESS!!!! Coaster Calendar- An Annie’s Favorite! Tags: "2012 Letterpress Coaster Calendar", "Annie's Blue Ribbon General Store"
Someone from a fun blog called today asking for my favorite items- that is always soo hard for me to pick! I love sooo many of our fun & functional items. This 2012 Letterpress Calendar is on the top of my list though- it’s soo pretty and sweet. Besides the beautiful letterpress seasonal images, each month can also be used as a coaster– plus there is a silver stand included. 2012 Letterpress Coaster Calendar– $22.50. Ballparks Baseball in Esquire’s Gift Guide!!! Tags: "Annie's Blue Ribbon General Store", "Ballparks Baseball", "Esquire's Gift Guide"
We are sooo psyched to see our Ballparks Baseball in Esquire’s gift Guide for Cool Gifts Under $100! (this baby’s a steal for $22.50) It’s a map of America, featuring the most famous ballparks on a handmade baseball! What a great gift! Fenway Park, Yankee Stadium, Shea Stadium/Citi Field, Citizens Bank Park, Camden Yards, Wrigley Field, Busch Stadium, Dodger Stadium, and many more… They’re all here. Ballparks Baseball– $22.50. It’s ADVENT CALENDAR TIME!! Get your Chocolate Advent Calendars now, before they SELL OUT! Tags: "Annie's Blue Ribbon General Store", "Chocolate Advent Calendars"
December 1st is right around the corner, don’t forget to get your Advent Calendars NOW!! These cute (& yummy!) 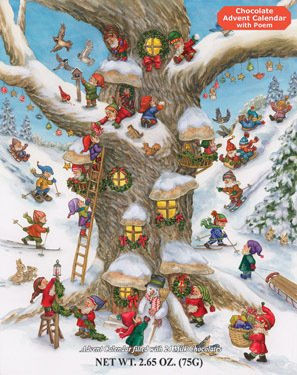 Chocolate Advent Calendars ALWAYS sell out, so be sure to order one or stop by to get yours SOON! 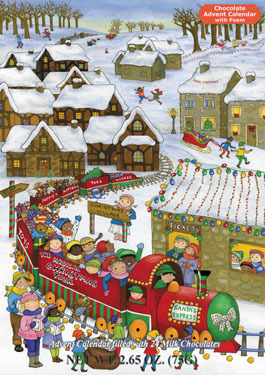 Santa Express (above) Chocolate Advent Calendar & Elf Magic (below) Chocolate Advent Calendar– $6.50 each. Tags: "Annie's Blue Ribbon General Store", "Put some Hair on your chest flask", "Time Out New York's Holiday Gift Guide", "To Hell with Work Flask"
YAY!! 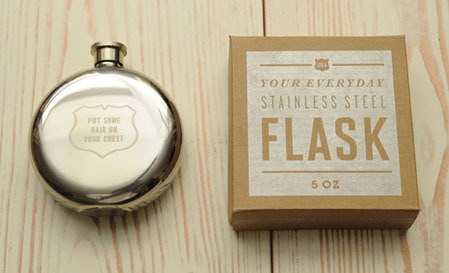 Our clever little flask (not soo little, holds 3 oz. of your libation of choice) made it’s way into Time Out New York’s Holiday Gift Guide (Unique Gifts for Coworkers). These are hilarious, and come in a couple different styles (“Put Some Hair on Your Chest” -see below, that one’s 5 oz) and 2 different sizes, all neatly packed in a cool kraft box. To Hell With Work Flask– $24.95.